It didn’t take long to fall in love with Return to PopoloCrois: A Story Of Seasons Fairytale. 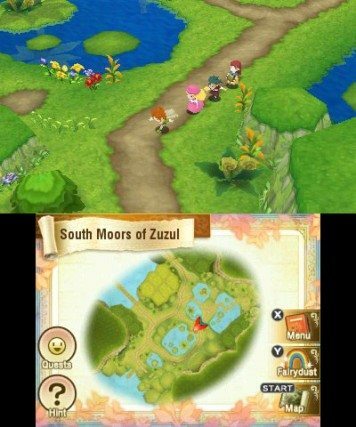 A somewhat obtuse name, this Nintendo 3DS exclusive once again brings to life the world of PopoloCrois first seen in a manga series penned by Yohsuke Tamori with Marvelous Interactive’s Story of Seasons, which was previously known in the west as Harvest Moon. Such a mirthful collaboration sees players cast in a fantastical kingdom of magic and knights, that is watched over by humans, dragons, and fairies. PopoloCrois, which, as a name, combines the Italian word “popolo” (people) and the French word “croisé” (crossing), is a wondrous place to be, and is ruled by a human king named Paulo and his half-dragon son Pietro, who is next in line for the throne. Marmela, a representative from Galariland, pleads for an audience with the king. Her kingdom has been left ravaged by shadowy creatures that are corrupting the soil, preventing any crops from growing for her people to harvest. With PopoloCrois suffering from the same phenomenon, Marmela recommends that Pietro should visit Galariland as an ambassador, to witness the damage first-hand and learn how the Galari is fighting back. But, soon after he arrives, Pietro soon realises that it was a trick and that he is trapped with no immediate way for him to return home. Soon taking shelter in a long-abandoned farmhouse, Pietro works hard to cultivate the nearby land. But his ultimate goal is to resurrect the Goddess Galariel, to drive back the darkness and help him return home. Friends that you meet along the way are packed with personality, whether that be the loyal Blue Wolf, the forgetful GamiGami, or the talkative fairy Connie. This helps to make Return to PopoloCrois a memorable adventure, which is surely what most hope for when they sink such an extended amount of time into a game. As a hybrid genre, Return to PopoloCrois somewhat unevenly splits your time between tactical turn-based combat and Story of Seasons elements that will see you harvest crops, swing a net at bugs, and tend livestock. This busies but diversifies your time, although those that choose to tackle the 30-hour main storyline will spend the majority of their time in combat rather than whiling away the hours farming. Battles are grid-based encounters, largely taking place when fairy magic shrinks you so that you can explore the undergrowth and hunt out black beasts that are polluting the land with darkness. The players can move their characters a set distance before performing a chosen action, whether that be attacking, using magic or an item. Strategy will see you surround foes especially when tackling tougher bosses, and each member of your party will have their own role to play in a securing victory. As with Bravely Default: Flying Fairy, those that want fewer battles can reduce the encounter rate in the options menu, which will suit those that just want to experience the story although risks leaving your party under-levelled. Meanwhile, the crop, animal tending, and item synthesis mechanics will be familiar to those that have dabbled in either Harvest Moon or Story of Seasons, simple in their accessibility but having enough depth to reward those that sink their time into them. The graphical style is superb, drawn from the manga from which Return to PopoloCrois takes its inspiration. Animated cutscenes only help to raise the production value, which, in terms of sound, sports two Japanese voice tracks with traditional or more modern voice actors and an English dub. There have certainly been no shortcuts taken in localising the game, and the script allows for plenty of hilarious moments as Pietro meets new characters on his journey. Those concerned that Return to PopoloCrois will be over all too soon needn’t worry, with side quests galore presenting chance to lengthen your time with the game. StreetPass is also supported, seeing players exchange treasure maps. Return to PopoloCrois: A Story Of Seasons Fairytale is brimming with charm and personality, and amounts to an adventure that will long linger in your memory after its conclusion.